After the Duomo, I moved on to San Ambrogio, Saint Ambrosio's favourite church. It's a Romanesque brick construction with two tall bell towers. The inside reminds me a lot of the Bunbury Cathedral in W.A. 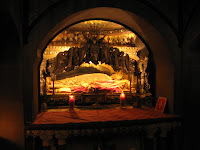 The real interest (to me anyway) of the church is Saint Ambrosio's body in the crypt, lying in state between two Roman era martyrs. The martyrs wear red, while the saint wears his robes of office. Their bodies are directly below the altar of the church. It certainly freaked out the other tourists. It is strange to think how long this place has been a church. Nothing like it back home!